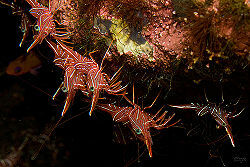 The dancing shrimp is a common name for any of the species of shrimp belonging to the taxonomic family Rhynchocinetidae. 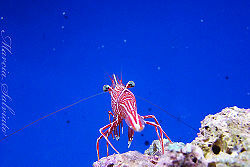 They are generally distinguished from other shrimp by their movable rostrum (beak). The dancing shrimp is known for its long, serrated rostrum that has a hinge that lets them move it up and down. You look at the size of the chelipeds (legs with a claw or pincer) to determine if they are male or female. The males have a more elongated one. Since they have a nocturnal lifestyle their color is red. Scott W. Michael, live aqurium, 12/2/09. This page was last modified on 11 August 2014, at 21:42.